SinuCleanse® Nasal Wash products were developed by a leading Ear, Nose & Throat Physician as an all-natural way to immediately relieve nasal congestion & sinus symptoms without the worry of any harmful side-effects or drug interactions. 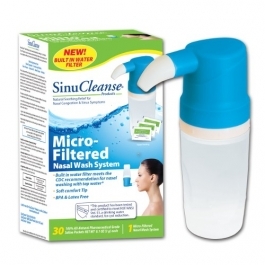 The SinuCleanse® Micro-Filtered Nasal Wash system is a revolutionary new product that makes receiving the proven benefits of Nasal Washing easier than ever. The built in water filter meets the CDC recommendation for nasal washing with tap water. This provides peace of mind, while also eliminating the cost of bottled water. It also allows for easier temperate control of the saline solution for a soothing and more comfortable nasal wash. The patent pending Micro-Filtered System incorporates additional innovations to maximize the comfort and convenience of nasal washing. Inverted filter technology with anti-backflow valve uses a combination of gravity and positive pressure to provide an easy to control and comfortable flow in the saline solution. Ergonomically designed bottle and soft nasal tip are comfortable to use and easy to clean. Adults & Children 4 Years & Over Use 1 - 2 packets per 8 fl oz (240 mL) up to every 2 hours as needed. Children Under 4 Years: Consult a Physician. The Micro-Filtered System can be used with the enclosed saline packets to make either an Isotonic or Hypertonic solution. An Isotonic solution has a salt concentration similar to your body and some people find this more comfortable to use. A Hypertonic solution is more concentrated, similar to the salt concentration of ocean water. Both are beneficial to your sinus and nasal health. Sodium Bicarbonate (USP 700 mg), Sodium Chloride (USP 2300 mg).